Minutes | Homeowners Association for Westheimer Estates, Inc.
Minutes, also known as protocols or, informally, notes, are the instant written record of a meeting. They typically describe the events of the meeting, starting with a list of attendees, a statement of the issues considered by the participants, and related responses or decisions for the issues. Minutes may be created during the meeting by a typist or other individual, who prepare the minutes and issue them to the participants afterwards. Alternatively, the meeting can be audiorecorded or a group’s appointed or informally assigned Secretary may take notes, with minutes prepared later. It is usually important for the minutes to be terse and only include a summary of discussion and decisions. A verbatim report is typically not useful. The minutes of certain groups, such as a corporate board of directors, must be kept on file and are important legal documents. 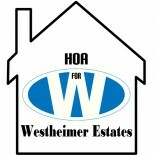 The Westheimer Estates Homeowners Association meeting minutes will always be posted and available online after it has been approved by the board and before any planned general meeting.